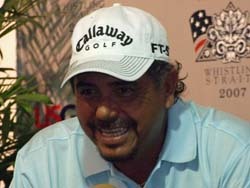 Argentina&apos;s Eduardo Romero sits in the clubhouse with the early lead at the 28th U.S. Senior Open after firing a 6-under par 66 at Whistling Straits in Haven, WI. Romero&apos;s opening round included an eagle on 16. He said conditions were ideal early on before winds picked up a bit late. Romero has one Champions Tour win to his credit and while there&apos;s a long way to go, the Argentine is off to a great start.